CEBU CITY, Philippines - Seabees from Naval Mobile Construction Battalion 1 Construction Civic Action Detail Philippines are conducting humanitarian assistance and construction operations in Cebu City and Carcar, Philippines, as part of their 2014 deployment to the Pacific. 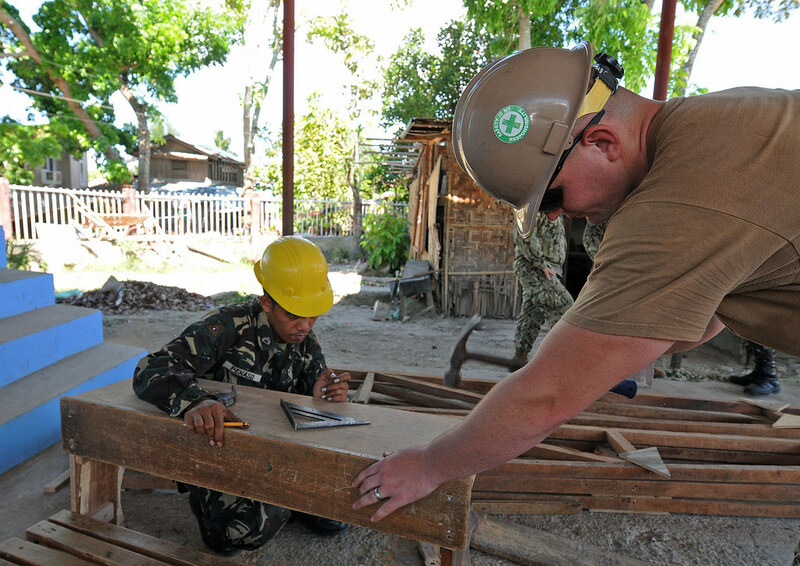 In the spirit of "tapat na kalooban," the Tagalog phrase for good will, the Seabees and soldiers from the Philippine Army are building a two-classroom extension to a local school, which will accommodate more students. "This project is important and very much appreciated by the local population, since this school's total population is about 400 high school and 200 lower level students," said Capt. Espargia, Philippine Army 53rd Engineering Construction Brigade team leader for the Bayanihan Carcar City, Cebu. "If you see the make-shift building that the high school is currently using, it is not conducive to learning, so the population is very thankful for the Seabees' upcoming project." Espargia said that the team's impact will not only be from the actual work completed at the school, but also through their presence and interaction with the local Filipinos. "Our team is very willing to assist the U.S. Navy Seabees in order to bring these projects to the city of Carcar, Cebu. The population of people in the area notices our relationship between the U.S Navy and the Philippine Army working together and is much appreciated," said Espargia. "The populaces around here, from time to time, come onsite just to see our personnel and the Seabees working together. The people of the community are excited to see the structures rise. The school and the structures will become a memorial gift to us from the U.S. Navy." NMCB 1 is also partnering with the Cebu City Police to make additions to their marksmanship course by constructing training concealment barriers at their Cebu City base. "We focus on intelligence security operations for our area. Our partnership with the Seabees will benefit us a lot because the tactics and techniques will help enhance our training," said Police Senior Inspector Joeson Parallag from Regional Public Safety Battalion 7. "For us in the military and the police, we see our support from [Seabees] and how it will help us to improve at our job and what we do for our people." "It is a privilege for us to work with the Americans for the betterment of the nation of the Philippines, especially since like President Obama said, we have historically worked together for the greater good of our nations," said Police Inspector Irvin Vellen, company commander and officer in charge of Regional Public Safety Battalion 7. "Your work on our base will help us acquire knowledge from your style of marksmanship, and we are thankful for your help." NMCB 1 CCAD Philippines Sailors share their host nation's excitement about the opportunity to work together and aims to achieve common goals through its partnerships and collaborations. "I think it's important for us to be here in the Philippines because we don't get the opportunity to work with different country's militaries often or to interact with people from the host nation," said Builder 3rd Class Eric Millisor, NMCB 1 CCAD Philippines. "On this deployment, we get to show the people of the Philippines that we are not only military members, but that we are compassionate people as well," said Millisor. "On our COMREL project here, we have the opportunity to work and interact with some of the local villagers, and they help us when we are sifting sand or carrying materials. They get to see what hard workers we are, how much we care about the well-being and success of their community, and through it all, they are right out there with us." NMCB 1 provides combat-ready engineer forces in response to Combatant Commander and Naval Component Commander requirements and provides planning and operational support for Seabee employment. The continued operations in the Pacific Command help demonstrate the U.S. commitment to developing enduring relationships, and strengthening local institutions and communities throughout the region. At U.S. locations, Seabees will perform missions to prepare for disaster support and civic assistance missions. NMCB 1 is homeported in Gulfport, Miss., and has 13 global details deployed throughout the United States and Pacific area of operations in Japan, Korea, Diego Garcia, Cambodia, Philippines, Timor Leste and Guam.